What has Sidewalk Labs gained from this “partnership” with Waterfront Toronto? One thing is the reputational cover for how it’s procuring its vendors. Imagine you were a small or medium sized business in Toronto and you wanted to be part of this Quayside project by engaging as a consultant or a designer. Then you find out that the only way your firm can participate is by handing over your work to Sidewalk Labs — to give them your intellectual property, which they can then resell elsewhere. This Sidewalk Toronto “partnership” has effectively created a barrier for some local firms to participate in the development of Quayside. If Sidewalk Labs were here doing direct business with these local firms, fine, there’s really nothing to say — that’s up to the companies involved. But this is being done under the auspices of a partnership with Waterfront Toronto, so by association it’s implicit that this is an endorsed approach by Waterfront Toronto - the public corporation with a mandate to represent Toronto residents. This deal has had two very distinct narratives since day one. The “this is good for Toronto and jobs and growth and innovation” story, and then the story of what this neighbourhood might actually be for the people that live in it, if the plan were to be approved. The public consultation has focused almost exclusively on the second story with little mention of the first. But the urban innovation scheme warrants discussion too. This is political and there are multiple approaches to consider for the local economy, particularly when there may be impacts on city service provision. 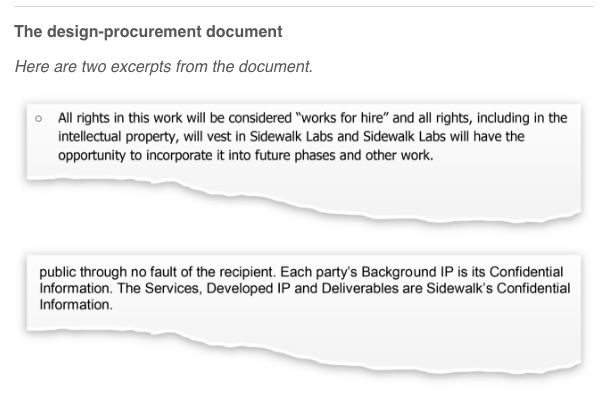 The RFP that Waterfront Toronto issued contained a clause about intellectual property (pg. 18), so there is nothing surprising about this topic at all. Yet with a 10 million USD communications budget, no one has made any time to talk about intellectual property with us residents - to explore how it works, and to explore the ways it may be part of this project. The innovation play has been presented as fact, as a normative good. In an embarrassingly simple analysis, politicians seem to think this project is cool and that it’s some kind of magical innovation and jobs something something. It would be a stellar time for someone from Waterfront Toronto to break out an analysis of the budget laid out in the Plan Development Agreement (pgs. 32–34). Because how this actually plays out for Toronto residents, workers, and business owners, has not been the subject of much interrogation or analysis. The way the business model for Sidewalk Toronto has been described remains vague. And it’s never been offered up proactively, only spoken of when raised by the public. After ten months, this intellectual property approach confirms one of the ways Sidewalk Labs may be expecting to make a return on its investment. Why hasn’t Waterfront Toronto taken charge of this narrative and explained how this IP approach is good for the local economy? This project should be about supporting local companies and their independent development rather than getting them mixed up in the risks inherent in the belief that other cities will want Sidewalk Labs’ products. This siren call of shared IP opens the door to the idea of imaginary future gains, which might shift political focus away from what’s needed to make this deal work locally for the people of Toronto, and towards imagined revenue from Sidewalk Labs products created in Toronto, demand that currently does not exist. The trend in cities is towards better procurement and hopefully to more open source and shared licensing opportunities, not more individual proprietary sales situations— bad deals that cities have made for decades. We need to be talking about these things and what these approaches to IP might mean for this project. Before we get too far down the track of IP and who should own it, we need to consider where and why it is being applied in the first place. The question that has to be asked again and again is: what’s best for the people that live here and what does the ongoing maintenance of that scenario look like. There are *a lot* of people in Toronto that want to talk about the requirements we as residents can set for this work, and the options we should be considering to reframe the conversation. There are other cities in Canada laying out the approaches they want to take. We’re all finding each other and we’ll be sharing some ways to participate in a joint effort to write out some requirements for this project — more on that soon.